For the month of October I’ll be running a fingerloop braiding tutorial on the Braid Society‘s online yahoo discussion group braids_and_bands (anybody can join this list, you don’t have to be in the Braid Society). They’ve hosted some really impressive tutorials in the past, from simple to complex—including Sue Foulkes’ incredible backstrap weaving tutorial on Saami bands —that was my first real weaving experience. I couldn’t believe I was actually following a weaving draft! 8, 6, and 4-loop spiral braids, plus 2-loop braids and fringe (cotton, rayon, silk). Click on photos for more detail. The loop/ eyelet starts will be covered in the tutorial, too. My tutorial will be toward the other end of the spectrum—extremely simple, up to just slightly challenging. I’ll be starting with a loop braid of 2 loops (yes, you really can make a braid with only 2 loops! ), and a spiral braid that’s quite different from the braids I’ve covered so far on this blog. It can be made with as few loops as 4, or as many as 10, and has several interesting color pattern possibilities as well as the classic spiral pattern. I also want to show some quick and fun braids that can be made with only 3 loops. 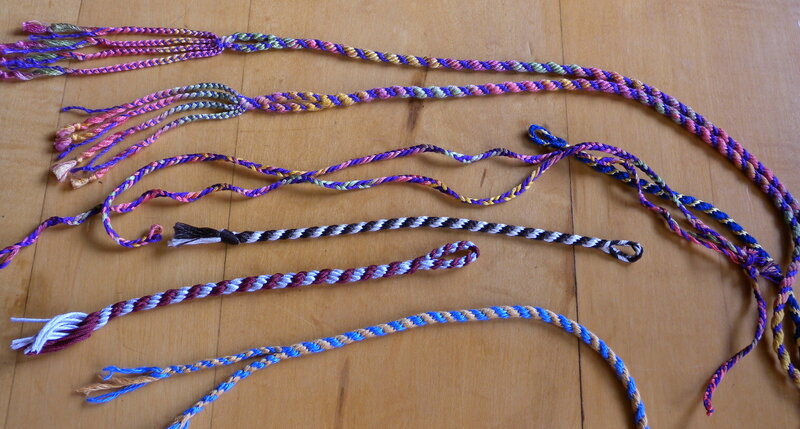 I make 3-loop braids all the time—as endings on larger braids, for quick, pretty ribbons and cords, and to teach to kids under 10 or 11, but I kind of took them for granted until recently. I was showing some of my sample braids to a workshop participant who is a very accomplished kumihimo braider, makes gorgeous and perfect-looking kumihimo braids. She looked at a braid that I felt kind of proud of—it’s a double braid made out of silk buttonhole thread—small because of the size of the thread, but it has 18 loops, which is about my upper limit with fingerloop braiding (equivalent to a 36-tama kumihimo braid). But she barely even looked at the main part of the braid, she was so entranced by the fringe! The fringe on the bottom was a bunch of mostly 3-loop braids. If you braid a 3-loop braid “divided” you get two little 3-element braidlets (for the price of one—since you braid them 2-at-a-time). 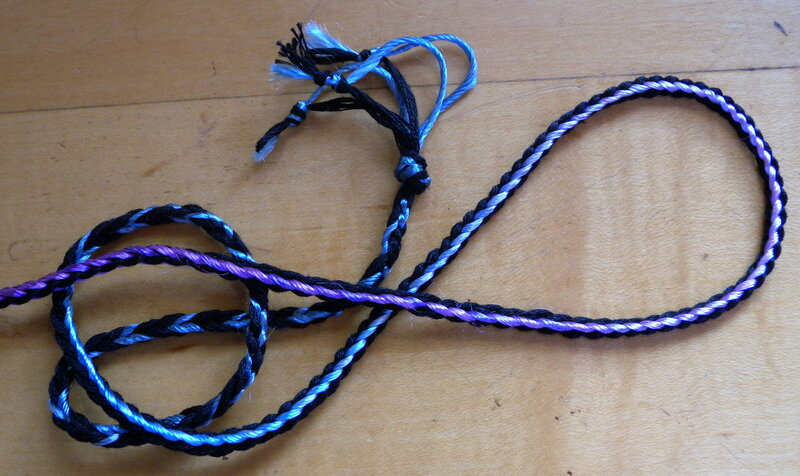 If an amazing kumihimo braider thinks 3-loop braids are awesome, I guess they must be! 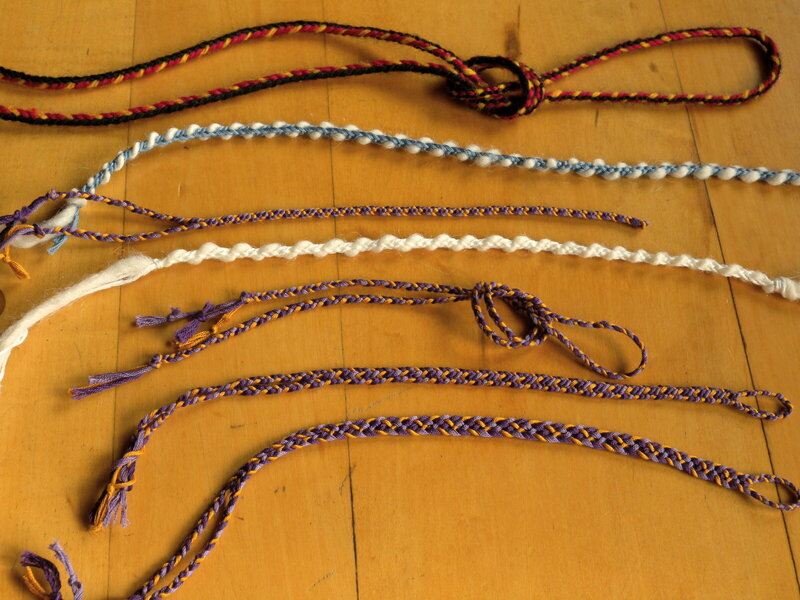 The thin braid in the center (tied in a loose knot) is a divided 3-loop braid. That means it comes out as two small, flat 3-strand braids, instead of one 6-strand braid. I braided it from its center point, braiding both halves at the same time. You can do that with any square braid, though I have to admit I’d never done it before for the whole length of a braid, only for a short loop at the top of a braid (as in the two braids below it), or in making a fringe of small braids as an ending for a bigger braid. 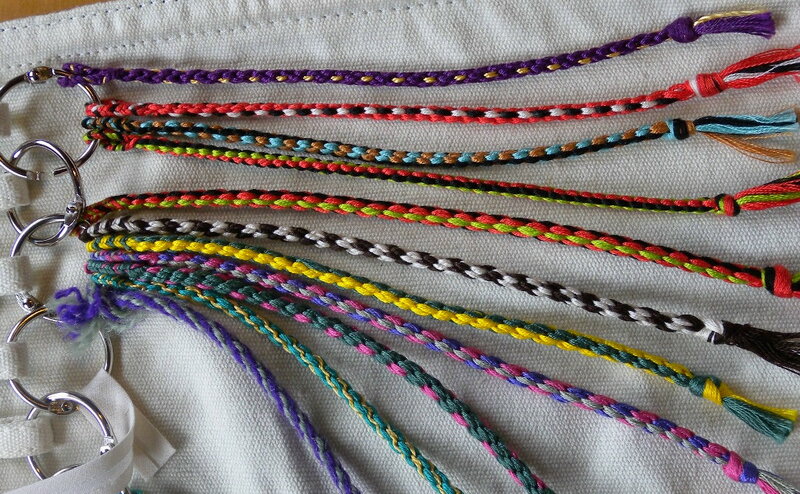 3-loop braids are great for drawstrings, tying up gifts, fun shoe-laces, cords, all kinds of things. I have a long one in my tent serving as a clothesline, and I use shorter ones as tie-ons for braiding and for my backstrap loom. Divided 3-loop braids are a great warp finish for weavings, too—as are 2-loop braids. 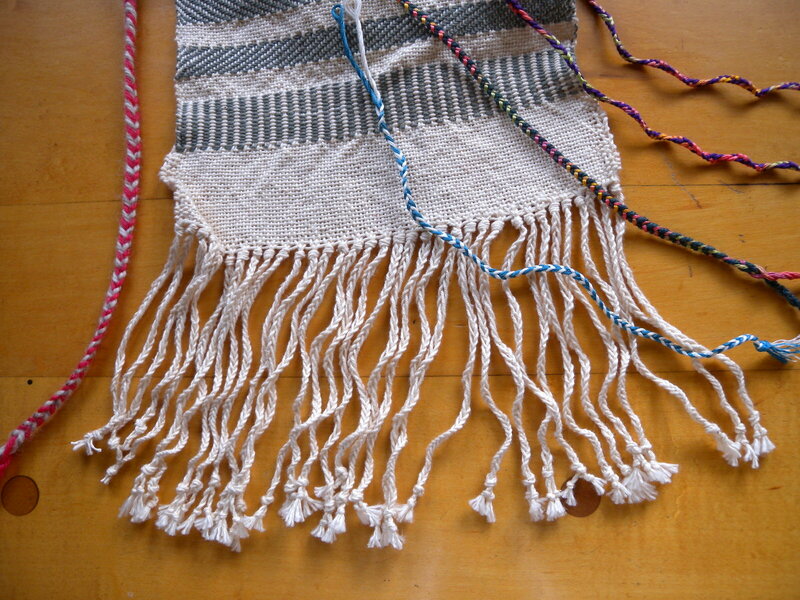 I’m still not enough of a weaver to have finished anything, but I found the weaving sample below in a thrift store. It had long, uncut warp ends. I tied them together in pairs to form loops, and braided them as 2-loop braids. This has got to be ten times faster than braiding thin little braids without loops, the way you braid a ‘pigtail’ hair braid. 2-loop braids come out with a slight twist (unless you block or press them), which I really like for a warp-finish—gives it a little body and bounce. 2-loop braids. 1st and 3rd from left have been blocked or pressed flat. The way these braids_and_bands online tutorials work is that the materials get posted into the list’s “files” section starting at the beginning of the month. (I may post mine in 2 or 3 installments rather than dump it all in at the beginning of the month). The tutorials stay on file, so are available to list members anytime after that—they don’t get removed at the end of the month. But it’s more fun to try them that month! That’s more likely when others will be trying it, too, and posting pics of their progress in the photo section, coming up with good questions, fun variations, etc. The Braids_and_Bands list is a fairly quiet one, but has some powerhouse members with a wide range of knowledge, so it’s a great resource. The list is owned by the Braid Society, but you don’t have to be a dues-paying member of the Braid Society to be a member of the online (free) yahoo list—the list is open to everyone. I encourage anyone interested in narrow-ware textiles to join—not just for my little tutorial, but for the list itself—plus their upcoming tutorials and the ones already in the files. 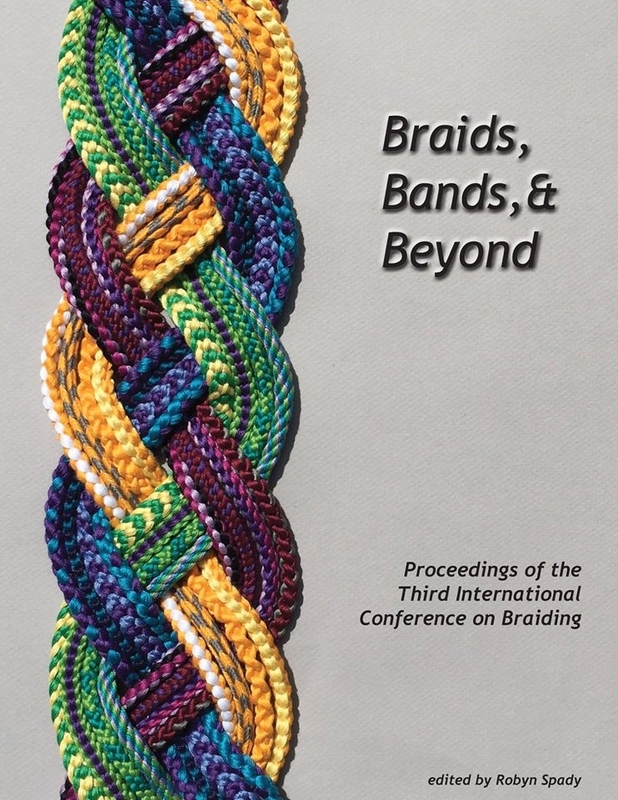 Even though you aren’t required to be a member of the Braid Society to join the yahoo list, if you ever get a chance to leaf through their annual (print) journal “Strands” you might want to join—it’s really beautiful and always packed with interesting articles on all aspects of narrow textiles. It’s well-known and coveted by weavers and braiders in the weaving guild I belong to, some of whom have joined the Braid Society just to get a subscription to Strands. Ok, that’s it for my pitch and my post! I hope to see you over on the Braids_and_Bands list in Oct. Thanks, Jenny! I do braid on trips. It doesn’t work well on an airplane, as you have to stretch your arms out to the sides to ‘beat the fell’. 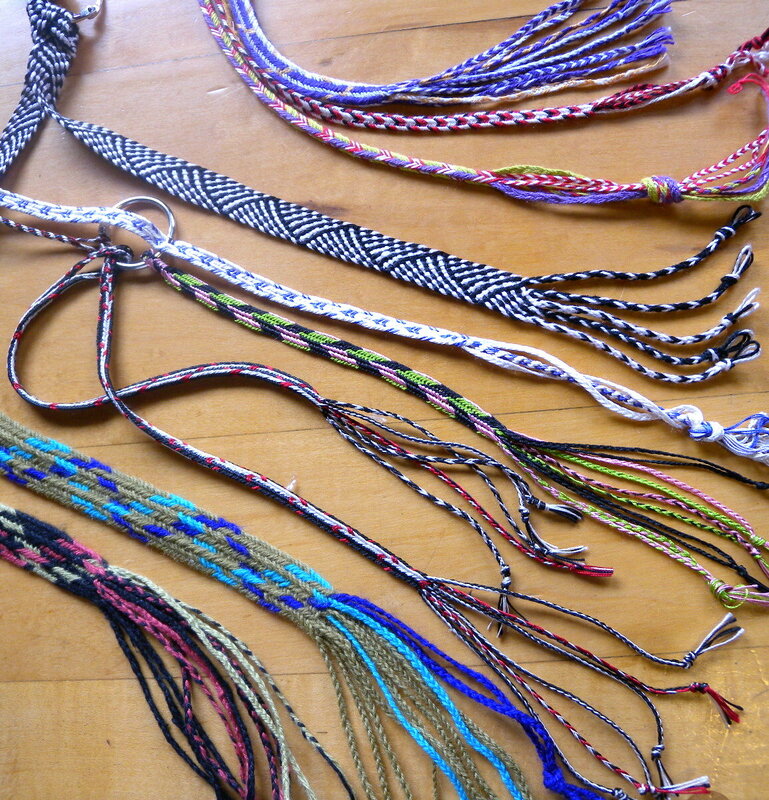 I braid everywhere else, though! Love your braids! And they look so portable-a good traveling project.